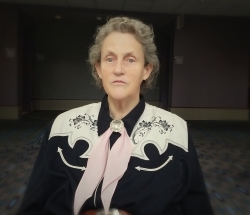 Future Horizons will be hosting the Texarkana Autism Conference with Dr. Temple Grandin – March 15, 2019. Texarkana, TX, January 15, 2019 — Join Dr. Temple Grandin and two great speakers for this special event in Texarkana, TX on March 15, 2019. This conference will include special appearances by Rebecca Moyes, MED, an autism consultant/trainer for several school districts in Pennsylvania and accomplished author, and Paula Aquilla, DO, BSc, OT, an occupational therapist and author of Sensory Strategies to Improve Communication, Social Skills. Rebecca Moyes, a former teacher in both public and private schools for nine years, is the mother of two children. Her oldest is diagnosed with Asperger’s syndrome. Rebecca, who is currently an autism consultant/trainer for several school districts in Pennsylvania, has published six books. Rebecca will provide practical strategies to teach students to become in tune to their emotions and develop skills to be more independent with controlling their impulses. Paula Aquilla, DO, BSc, OT is an occupational therapist. She has worked with adults and children in clinical, educational, home, and community-based settings. Paula is the coauthor of Building Bridges Through Sensory Integration and the author of “Sensory Strategies to Improve Communication, Social Skills,” and the new Sensory Detective book.